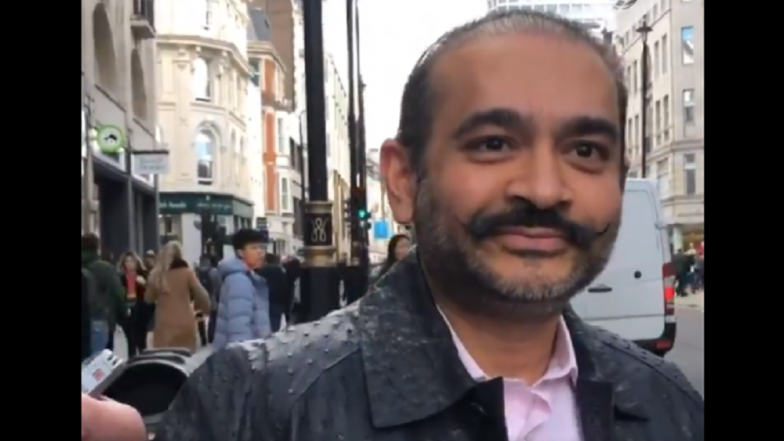 London/New Delhi, March 18: A UK court has issued an arrest warrant against fugitive Indian diamantaire Nirav Modi, wanted in the Rs 13,500 crore PNB fraud case, confirmed the Enforcement Directorate (ED) on Monday. According to the ED, the Westminster Court issued the arrest warrant on March 13. The development came days after the UK's The Telegraph newspaper claimed that Modi was spotted in London, leading to the Congress slamming the Bharatiya Janata Party (BJP) government for its "failure" to bring the fugitive diamantaire to justice while he apparently thrived elsewhere. Accused in the Rs 13,500-crore Punjab National Bank (PNB) fraud case, Nirav Modi is living openly in a three-bedroom flat, occupying half the floor of the landmark Centre Point tower block, The Telegraph had reported. The report also claimed Nirav Modi was involved in a new diamond business, run from an office in Soho, just a few hundred yards from his apartment. The new business was incorporated in May 2018, said the report. PNB Scam: Enforcement Directorate Files Fresh Charge Sheet Against Nirav Modi. The Interpol had issued a red corner notice against Nirav Modi in July 2018 on the request of the ED and the Central Bureau of Investigation (CBI). An extradition request against him has been pending before the UK authorities since last September. The ED on February 26 attached Rs 147 crore properties of Nirav Modi and his associate companies in connection with the PNB fraud case.